Most food tours are walking tours through popular districts of a city and include delicious food and drink tastings at some of the areas best restaurants. Participants of the Miami Food Tours enjoying delicious samples. From coast to coast, they are sweeping the nation and even the world, taking eating as we know it to the next level. Culinary food tours are what’s big and hot and now in the dining world and it’s easy to see why. For a nominal fee, you can visit a variety of restaurants for one meal, tasting your way around your own city or any city you happen to find yourself in. Throughout Florida, there are many culinary food tours connecting foodies with outstanding and award winning locally owned and operated restaurants. In Miami, the popular Miami Culinary Tours is all about tasting delicious and authentic cuisine around the city’s historic neighborhoods: South Beach, Little Havana and Wynwood. 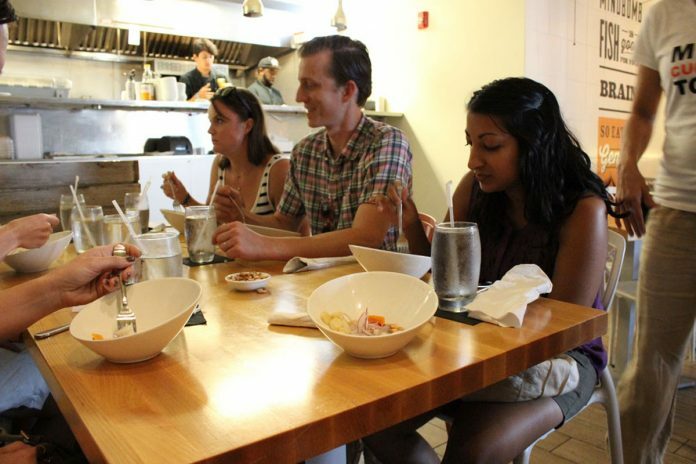 In Fort Lauderdale you can easily explore the city’s culinary history with Las Olas Food Tour. Key West Food Tours is a culinary adventure and eat like a local through the old-town of Key West! Naples Tasting Tour takes you to some of Naples most unique restaurants, markets and shops where you’ll get to sample favorite foods. Culinary food tours give you so much more than a taste of the city’s best food. They give you a big bite of the city, sharing the experiences and cultural heritage that beats within its vibrant heart. Fueling the foodie in all of us, culinary food tours make eating an epic experience by creating a walking party of sorts, which meets at one location and then leisurely ambles on to the next, all the while indulging in sensational samplings paired with refreshing libations. The fun doesn’t stop there. Diners are delighted with a tour along the way where they learn about the city as they move along to each consecutive location. Most tours last around 3 hours, and by the end, diners are filled to the brim with fine eats. On the South Beach tour in Miami for example, guests on the tour are typically treated to “Floribbean” cuisine, a delightful fusion of Floridian and Caribbean fare found nowhere else. The tour also ensures guests will get to experience the lively tastes of Cuba with bites from traditional Cuban restaurants, like mojo-marinated meats that are sidled up next to sweet fried plantains. And the Big Apple has never been juicier. There are 11 different food tours in the city that never sleeps. One of them veers around artsy Greenwich Village instead of touristy Times Square. It’s a perfect way to get in some of that famous New York-style pizza along with other tasty tidbits. On the west coast, California has 25 different culinary food tour experiences. Even small states, like the smallest of all – Rhode Island – have at least one culinary food tour. In the land abroad, you can find culinary food tours in Greece, Italy, France, Spain and more. Even just to the north up in Canada! That’s good news for your next trip. Instead of doing the same old boring trips to the museums or monuments, why not get a true taste of what each city is about? You can start with the one in your city and discover another reason to love where you live.